The first wagon trains, the first transcontinental railroad, and the first transcontinental highway crossed Donner Summit. So did the first transcontinental airway. When airplanes were new, pilots flew by the "seat of their pants" flying only when they could see. Pilots wanted to fly all the time though and people wanted airmail, so the Federal Government developed airways and entrepreneurs improved airplanes. The first transcontinental airway went right overhead here. The 1920's saw great improvements in flying. Planes began to carry radios (only receivers were required initially) and guidance devices. Radio and lighted beacons were set up to guide pilots and emergency landing strips were placed at regular intervals. To the left above you, on top of Signal Hill (the top of Donner Ski Ranch) there is still a beacon that rotated showing pilots the summit. Below the beacon were two lights oriented east-west in the direction of the official airway. Above you to the right was airway station #15 with "SF - SL 15" painted on one side of the roof and "Donner" on the other. regular intervals all the way across the country along the transcontinental route. They provided up to the minute weather information, tracked traffic and provided communication. The station on Donner Summit was commissioned in 1931. It was decommissioned in 1952 when planes moved to more advanced technology, more powerful radio beacons, and flew higher, making the beacons irrelevant. 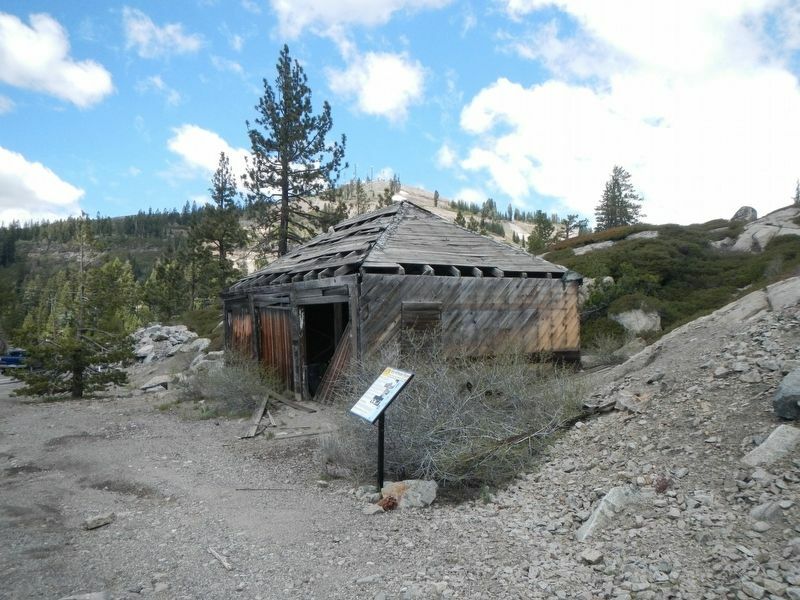 The Donner station was not a preferred assignment due to the winter isolation of 40 foot snowfalls. Personnel had to travel miles over the snow to get to the train station so they could go to Truckee for mail and supplies. More hardy operators skied the whole way down to Truckee. "We occasionally had dinner with Marie (Fitzpatrick, pictured above in front of the station's view of Donner Lake) who was very gracious...the station... was quite cozy, which was good considering the incredible winds that hammered it. The rope line that served as a handrail was also a comfort when accessing the place. My Mom and I were sometimes a bit silly after dinner on our way down and we would start running and laughing on those rocks, grabbing the rope in time to stop us from a bad fall." Make your way up the rock and look for the old foundation. up to Lake Mary for a picnic. Follow the Pacific Crest Trail north for lakes and great views. Marker series. This marker is included in the Donner Summit Historical Society marker series. Location. 39° 19.006′ N, 120° 19.616′ W. Marker is near Norden, California, in Nevada County. 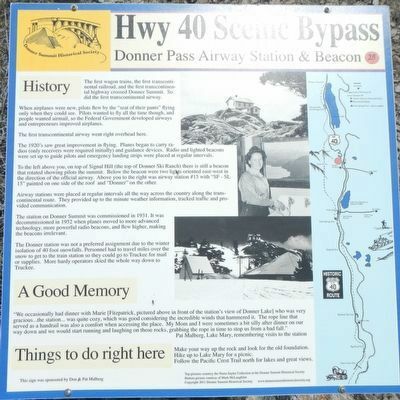 Marker is on Donner Pass Road near Old Donner Summit Road, on the left when traveling east. Touch for map. 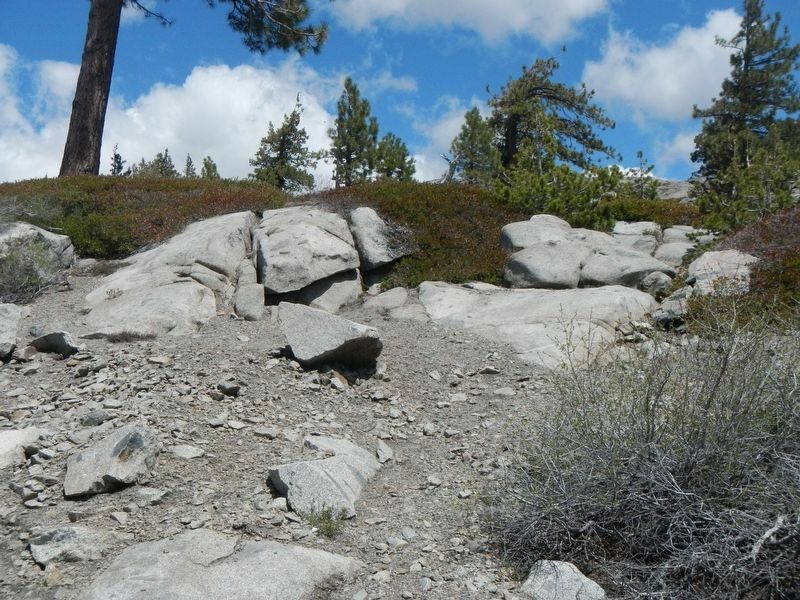 Marker is at or near this postal address: 19219 Donner Summit Road, Soda Springs CA 95728, United States of America. Touch for directions. Other nearby markers. At least 8 other markers are within walking distance of this marker. Sugar Bowl Academy (within shouting distance of this marker); Great Summit Tunnel of the Sierra Nevada (within shouting distance of this marker); Summit Hotel (approx. 0.2 miles away); Tunnel 6 (approx. 0.2 miles away); Donner Ski Ranch (approx. 0.2 miles away); Sacred Symbols From Ancient Times (approx. 0.3 miles away); Petroglyphs (approx. 0.3 miles away); China Wall (approx. 0.3 miles away). Touch for a list and map of all markers in Norden. More. Search the internet for Donner Pass Airway Station & Beacon. Credits. This page was last revised on March 6, 2019. This page originally submitted on February 9, 2019, by Barry Swackhamer of San Jose, California. This page has been viewed 66 times since then. Last updated on March 2, 2019, by Craig Baker of Sylmar, California. Photos: 1, 2, 3. submitted on February 9, 2019, by Barry Swackhamer of San Jose, California. • Andrew Ruppenstein was the editor who published this page.